Jan31So…typically basements can be cold, damp places. When you finish your basement you want the space to be comfortable and insulation can help you do that. But because of the typical dampness, you have to be very careful to select the right type of insulation for your project. 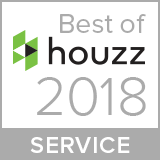 An architect can help you make the right selections – they can do dew point calculations and analyze your space and conditions and help to prevent moisture and mold issues in your home – it’s amazing how much damage a little water vapor can do. In our space we had had some MAJOR water issues. Our soils around our home is full of clay and does not drain well. The builder sited our home a little too low into the ground and the window wells in two of the windows into our basement would fill up with water and it created two lovely (not) water features in our basement during heavy storms. Water literally poured in through the windows. After several attempts at regrading and digging French drains, we decided to remove these two windows and infill them with concrete block. We waterproofed the outside faces and have not had a water issue ever since. The key here: solve the water problem before finishing your space. So now we have a “dry” basement, but the floor is concrete which contains moisture as well, even though it is a trace amount, it is still considered damp because it is below grade. We also have a sump pump that drains foundation drains and condensate from our HVAC units, but there is always the potential for flooding via this pump and drain. We also have a water heater (as do most of you) – and everyone has seen what can happen if that breaks down when someone is not home. I’ll talk more about this when we talk about our flooring option. When building our stud walls around the perimeter, we left a gap behind the studs to allow for a little ventilation and to leave room for existing plumbing drains, etc. I specified fiberglass batt insulation for our basement as an economical choice and because it would be contained behind drywall in the conditioned space. The important thing to note is that I selected a formaldehyde-free fiberglass insulation to provide for better air quality. It also has a kraft paper vapor barrier. In our climate (eastern Pennsylvania – Zone 5) the vapor barrier is required to be on the WARM side of your wall (toward your conditioned space). I will repeat, we have a dry basement. In a damp basement, pink fiberglass is not the best choice – it can retain moisture which leads to mold growth. In those conditions a rigid board or other closed cell insulation would be a better choice. 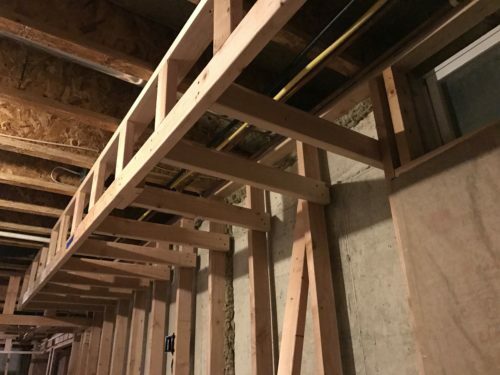 In addition to the fiberglass batts, because we left gaps behind the studs and because we have a lot of concealed spaces in our soffits, we are required to install fireblocking to prevent the spread of fire. These blocks are necessary every 10’ on center and can be constructed with plywood or as in our case, fireblocking insulation. We used a product called Roxul Safe-N-Sound. It is a stone wool insulation that is fire resistant and also provide excellent acoustical dampening. 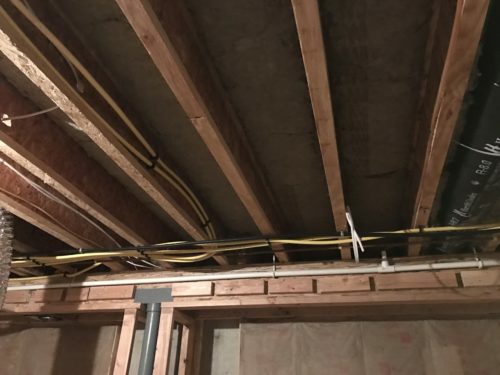 My husband installed all of this insulation – he used a bread knife to cut it and friction fit it in between the ceiling joists to provide some additional acoustical separation from the upstairs space. Small pieces were stuffed where a fire block was required, at the gap between the top plates of our new walls and the concrete wall as well as behind vertical studs. 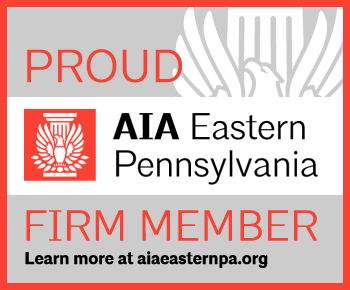 Always follow your code requirements where you live – an architect can help with this too! 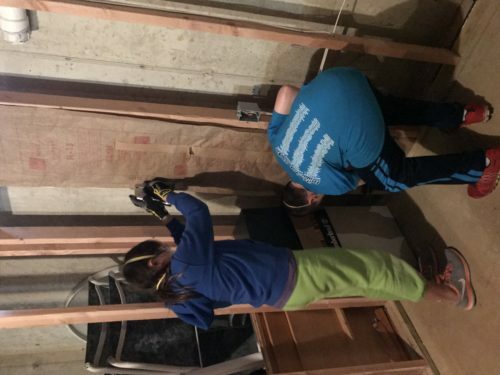 We also plan to insulate around the bathroom as well to minimize the sound transfer from this area to the other parts of the basement. Because we are insulating, we had to be careful to seal any exterior penetrations through the exterior face of our home – the water pipes are in the uninsulated soffits above and there is a higher potential for freezing pipes unless you maintain some condition space in those areas (which we are) but we spray insulated with cans of “Good Stuff” spray foam to fill the holes around pipes and penetrations. We also used it to seal the gap at our exterior basement exit door frame. We also turn off and drain our exterior hose bibs before the first frost each year as well. With any insulation product, you should use standard safety precautions. When working with fiberglass batts, you don’t want to breathe the fibers in, so a face mask and safety glasses are a must. We even had our kids helping during this phase – it’s easy work – but we wanted to make sure they were being safe while doing it (my son should actually have had a long sleeved shirt on as well – but have you ever tried to tell a teenage boy to do anything? And they did three batts and were “bored”…). Roxul is supposed to be inert and not harmful, but I would still recommend the mask and glasses as well – it was dusty work and shredded easily.